Americans and Germans express very different opinions about the state of relations between their two countries. While roughly two-in-three Americans characterize relations as good, a 56% majority of Germans take the opposite view. 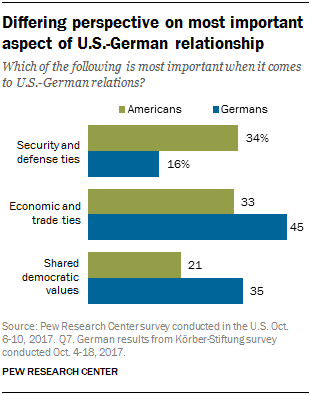 The two publics also have different perspectives on the core elements of the U.S.-German relationship. A 45% plurality of Germans believe economic and trade ties are the most important component of the relationship, while just around one-third point toward shared democratic values. Only 16% say security and defense ties are most important. Americans are almost evenly divided between those who say security and defense are the most important element of the relationship and those who name economic and trade ties. About one-in-five cite shared values about democracy. In both nations, there are partisan differences over what binds the two countries together.1 Among Americans, Republicans clearly see defense ties as most important (47%), with 28% naming economic and trade ties and just 12% naming shared values. Democrats are almost evenly divided across the three options. In Germany, supporters of Chancellor Angela Merkel’s center-right Christian Democratic Union (CDU) and its partner the Christian Social Union (CSU) tend to see economy and trade as the relationship’s most important aspect while placing relatively little importance on defense. Those who back the center-left Social Democratic Party (SPD) are split between democratic values and economic ties. Partisan divides also shape public opinion about other facets of the bilateral relationship. 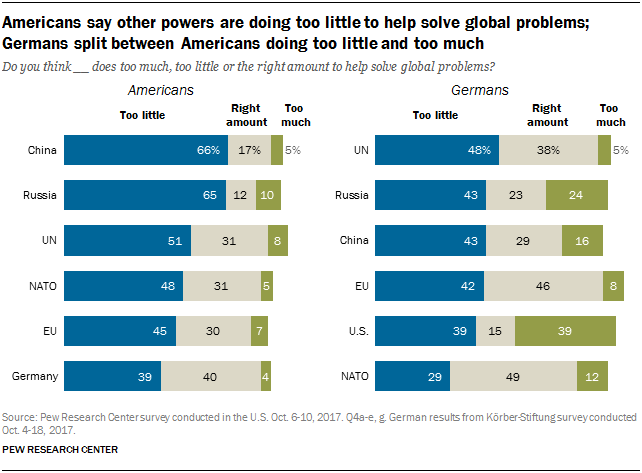 In the U.S., Democrats are more likely than Republicans to believe Germany is doing the right amount to help solve global problems. 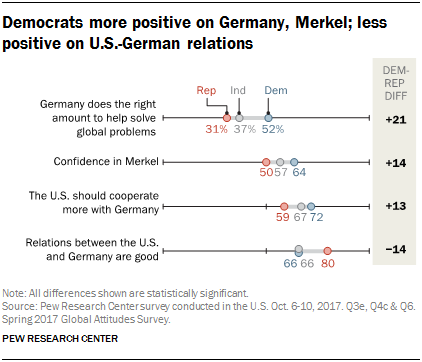 While supporters of both parties agree the U.S. should cooperate more with Germany, this belief is more common among Democrats. In addition, Democrats are more likely to name Germany as a top foreign policy partner for the U.S. 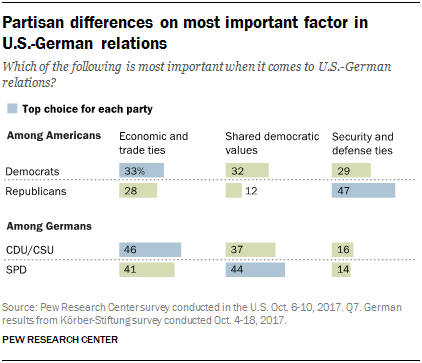 Among Democrats, 21% believe Germany is one of the two most important partners for the U.S., putting it in the third spot overall behind Great Britain (32%) and China (26%). Among Republicans, Germany is tied for the seventh spot, alongside Russia, with just 5% of Republicans citing it as a top partner. 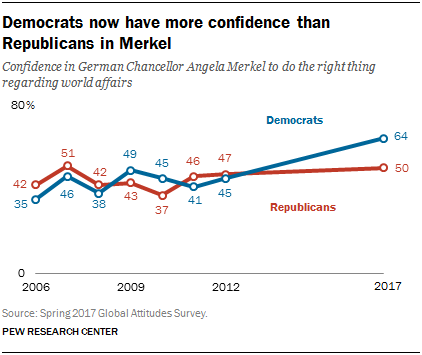 Democrats are also more likely to see trouble in the U.S.-German relationship. Roughly three-in-ten believe relations with Germany are bad, compared with just 12% of Republicans. However, majorities of both parties describe relations as good. In Germany, CDU/CSU and SPD voters agree that their country’s relations with the U.S. are in bad shape. At the same time, supporters of these parties also see the U.S. as a top foreign policy partner. These are among the key findings from parallel surveys fielded in the U.S. by Pew Research Center and in Germany by the Körber-Stiftung. The U.S. survey was conducted Oct. 6-10, 2017, among 1,012 respondents. The Germany survey was conducted Oct. 4-18, 2017, among 1,005 respondents. Additional findings are included from a Pew Research Center survey of Germany and the U.S., conducted Feb. 16-April 7, 2017, among 2,507 respondents. Correction (March 2018): A previous version of this report misstated results for Great Britain on survey questions Q1a-b in the United States. These results were revised March 1, 2018, as were the report and any graphics that used these results. The changes do not impact the report’s overall analysis. Trump unpopular in Germany, but Merkel gets high ratings in U.S. The first year of Donald Trump’s presidency has been characterized by new tensions for the transatlantic alliance and for U.S.-German relations. Before taking office, Trump called Merkel’s refugee policy a “catastrophic mistake.” Their first White House meeting made news when the two leaders awkwardly failed to shake hands. Merkel has questioned the U.S. administration’s commitment to America’s European allies, declaring in 2017 that Germany could no longer “completely depend” on the U.S. Tensions at the official level are reflected in German public opini0n. In a spring 2017 Pew Research Center poll, only 11% of Germans said they had confidence in Trump to do the right thing in world affairs. A year earlier, 86% had expressed confidence in Trump’s predecessor, Barack Obama. 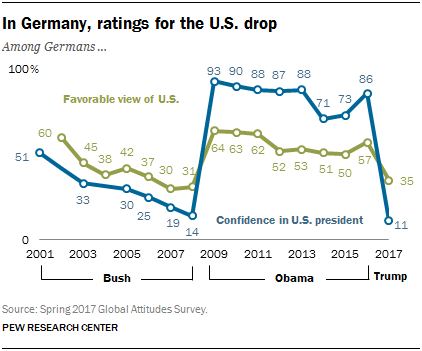 Meanwhile, American views of Germany’s leader have remained positive. Since Pew Research Center first asked about Angela Merkel in the U.S. in 2006, three main findings have stood out. First, positive ratings for Merkel have consistently outweighed negative ones, and this was true again in the 2017 survey, when 56% expressed confidence in her to do the right thing in world affairs, while just 31% lacked confidence. Second, Merkel has become better known – as recently as 2012, 31% of Americans had no opinion about the German leader, but in 2017 only 14% offered no opinion. Third, a partisan divide has emerged over Merkel. In 2012, there was virtually no difference between Democrats and Republicans, but in 2017 64% of Democrats had confidence in the chancellor, compared with only 50% among Republicans. 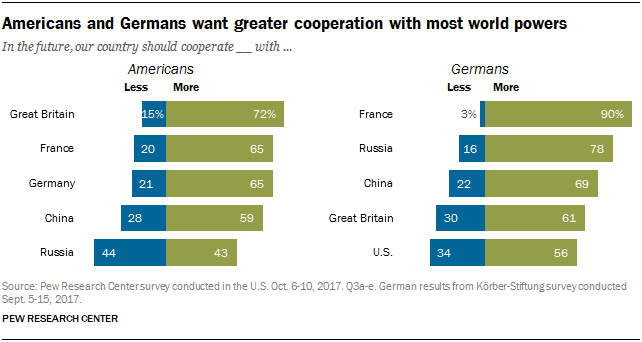 When asked which countries are their most important partners in global affairs, more than four-in-ten Germans say the U.S. is either their first or second most important. More than six-in-ten name France, while much fewer name Russia (11%), China (7%) or the UK (6%). Americans are much less likely to see Germany in this way – only 12% name Germany as one of America’s top two partners. Still, Germany does make the top four, trailing Great Britain (33%) and China (24%) and tying with Israel (12%). In both nations, there is a generational divide on this question. 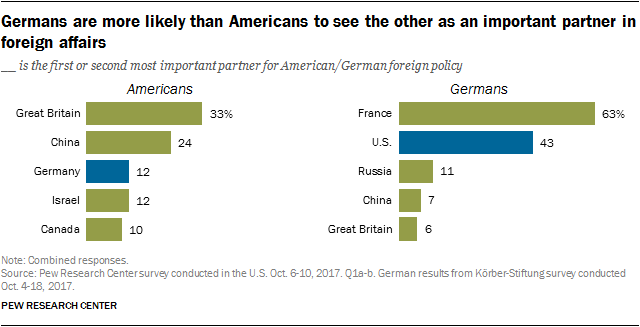 Among Germans of all age groups, France is most commonly named as their nation’s first or second most important foreign policy partner, followed by the U.S. However, among Germans ages 18 to 29, the U.S. trails France by less than 10 percentage points. Among Germans ages 60 and older, the U.S. trails France by nearly 30 points. In the U.S., those ages 45 and older most commonly name Great Britain as their nation’s first or second most important partner in world affairs. Americans ages 30 to 44 are split between Great Britain and China, and among those ages 18 to 29, China takes the top spot. Though both Republicans and Democrats tend to name Great Britain as their nation’s first or second most important foreign policy partner (42% and 32% respectively), among Republicans the second most common response is Israel (24%) and the third most common is China (18%). Among Democrats, China takes the second spot (26%) followed by Germany (21%). Both the American and German publics support cooperating more with a number of global powers in the future. Majorities across both nations want to work more with each other, as well as with France, Great Britain and China. However, fewer Germans want their country to cooperate more with the U.S. than with any other country tested. And roughly one-third in Germany (34%) say they want to cooperate less with the U.S. in the future. Almost eight-in-ten in Germany want to see their country working more with Russia. Americans are split – just 43% want increased cooperation with Moscow while 44% hold the opposite view. Democrats are much more likely than Republicans to say the U.S. should cooperate less with Russia in the future (55% versus 35% respectively). But when it comes to working with Germany, France, Great Britain and China, Democrats are more likely than Republicans to want increased cooperation. Young Americans (those ages 18-29) are more likely than older Americans (ages 60 and older) to say the U.S. should work more with France and Germany in coming years. When it comes to dealing with problems around the world, Americans are split on whether Germany does its fair share. About as many Americans say Germany does too little (39%) as say their European ally does the right amount (40%). Just 4% believe Germany is doing too much. 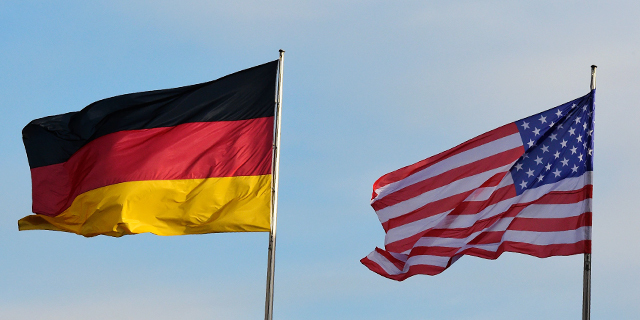 Germans are conflicted on the role the U.S. is playing in addressing global issues. Equal shares of the public believe the U.S. is doing too little (39%) or too much (39%). Few say the U.S. is doing the right amount (15%). Both nations tend to agree that China, Russia and the United Nations are doing too little. Americans are more likely to feel this way, with broad majorities saying China (66%) and Russia (65%) are not doing their share and roughly half saying the same about the UN. Germans are less sure, with smaller pluralities expressing this view. Americans tend to believe the European Union and NATO are not doing enough to help solve global problems. Germans believe that, on balance, NATO is doing the right amount, though they are more split on the EU. U.S. Democrats are more in line with the German public on these issues. Democrats are more likely than Republicans to say Germany, the EU and NATO are doing about what they should be to address international problems. In Germany, more than half of CDU/CSU voters (54%) believe the EU does the right amount on the world stage, while SPD voters (52%) say the EU does too little. One issue on which successive American presidents have encouraged Germany and other European allies to contribute more is defense. President Trump has repeatedly called on NATO members to spend more on security, and the Obama administration similarly implored European allies to boost their military spending. 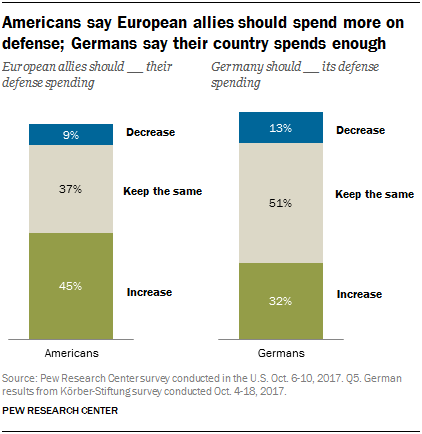 In the U.S., 45% say the country’s allies in Europe should spend more on their national defense, while 37% say spending levels should stay about the same and only 9% think they should be decreased. But there is a wide partisan gap on this issue, with 63% of Republicans calling for more spending from allies, compared with just 33% among Democrats. When asked about their own defense spending, only about one-in-three Germans (32%) want to see it increased. Roughly half say it should stay where it is, while 13% want it cut.